eholders to have their say in new National Sports Policy Framework. Ellen Keane, Paralympic Games World Championship bronze medalist. 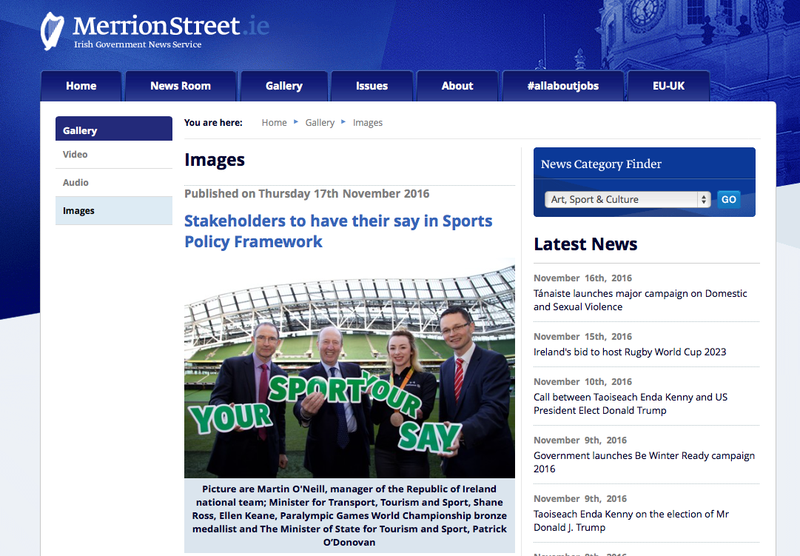 The Minister for Transport, Tourism and Sport, Shane Ross TD and the Minister of State for Tourism and Sport, Patrick O’Donovan TD, today launched a public consultation process on the development of a new National Sports Policy Framework. The aim of the consultation process is to give all stakeholders the opportunity to feed into the development of the new National Sports Policy. The policy will provide a framework for sport in Ireland over the next ten years and will set the agenda for Sport Ireland. Minister Ross said “I am delighted to launch the public consultation for a new National Sports Policy Framework. 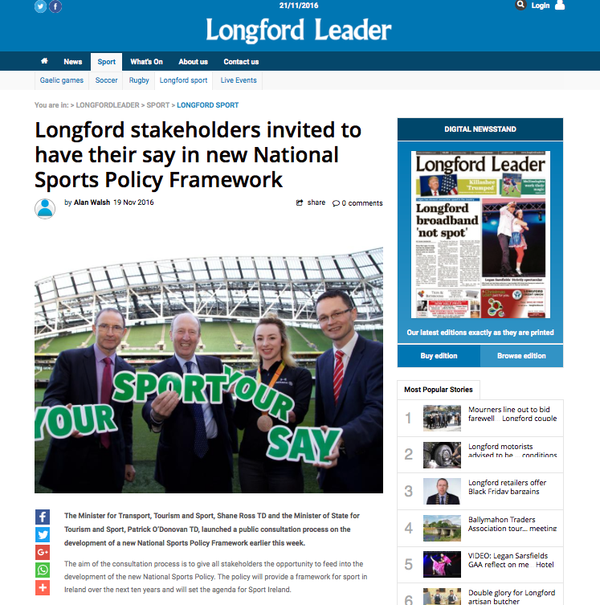 This is a very important consultation as it will give all relevant stakeholders an opportunity to make a real contribution to the new National Sports Policy Framework, which will be developed early next year. The framework will be the first of its kind for over 20 years and will set the agenda for sport over the coming years. Minister O’Donovan said “The consultation process on the new National Sports Policy provides an opportunity to everybody involved in sport to input their views, be they administrators, coaches and volunteers to participants, competitors and spectators. Sport Ireland, the National Governing Bodies of Sport, the Local Sports Partnerships and the many volunteers, coaches and administrators involved in sport are doing a lot of work throughout the country to increase participation in sport and support our elite athletes and the Government is strongly supportive of this work. The closing date for submissions is 17:00, 6 January 2017. In line with established practice for public consultation and subject to considerations of confidentiality, submissions will be published on the Department’s website and are subject to Freedom of Information legislation.